With more than 35 years in the Community Mental Health profession, Dr. Phyllis Harrison-Ross led a remarkably diverse professional career as a hospital clinical administrator, researcher, academic, public health consultant, forensic and child psychiatrist and public educator. Trained as an adult and child psychiatrist as well as a pediatrician, she continues to lend her administrative and clinical talents to serving diverse, hard-to-reach and underserved populations. She authored two books and co-authored several textbook chapters and articles on prison health, most recently on women prisoners. 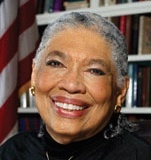 No stranger to the media, Dr. Harrison-Ross, was moderator of her own parent-education television series, “All About Parents,” in the early 1970s. She co-hosted a radio talk show, “Ethics on the Air,” and was a member of the editorial advisory board of the New York Amsterdam News. She was a distinguished Life Fellow of the American Psychiatric Association, a former President of the Black Psychiatrists of America, and also served as an elected member of the Governing Council of the American Hospital Association. Among other notable achievements, Dr. Harrison-Ross received the American Psychiatric Association’s Solomon Carter Fuller Award for distinguished service to improve the lives of black people in 2004. Nothing presents a graver threat to our shared humanity than the scourge of genocide. The Auschwitz Institute’s critical work in education and network building towards its prevention represents the most innovative and effective path towards ensuring the pledge of “Never Again” truly comes to pass for all citizens of the world.